The issue of policy dynamics is a key one in policy studies and one which is particularly amenable to comparative policy research. 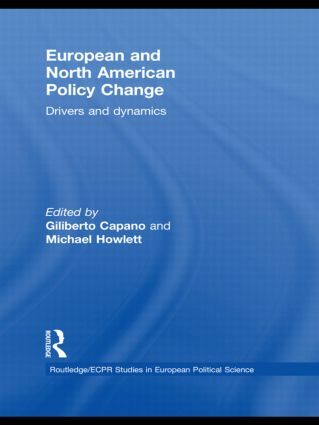 This edited volume brings together some of the leading scholars in the field to examine the definition, conceptualization and operationalization of policy change. This book will be of interest to students and scholars of public policy, public administration and public management, and political science programmes worldwide. Giliberto Capano is Professor of Political Science and Public Policy at the University of Bologna, Forlì Campus. He specializes in public policy analysis, Italian legislative behaviour, public administration, and comparative higher education. Michael Howlett is Burnaby Mountain Professor in the Department of Political Science, Simon Fraser University, Vancouver, BC, Canada. He specializes in public policy analysis, Canadian political economy, and resource and environmental policy.